Holy Stone HS170 Predator is a perfect drone for beginners who want to give drone flying a try. This entry-level drone is not regulated by the FAA so you can fly it anywhere freely. In our list of Top 5 Best Drones, it ranked at #1. Holy Stone HS170 Predator sports 4 rotors with white blades on the front and black on the rear, so you can identify which direction the drone is facing easily. It also includes LEDs with blue lights in the front and red ones in the rear on a sculpted polycarbonate body. Its windproof and shockproof design ensure the best flying experience regardless of setting. The chassis is made out of grade-A polycarbonate material, ensuring that the drone is both resistant and aerodynamic. Unlike other drones, each arm of HS170 also has little landing feet that protect the motors from getting damaged in a hard landing. It also has curved propeller guards to soften impacts on the wall or ceiling. 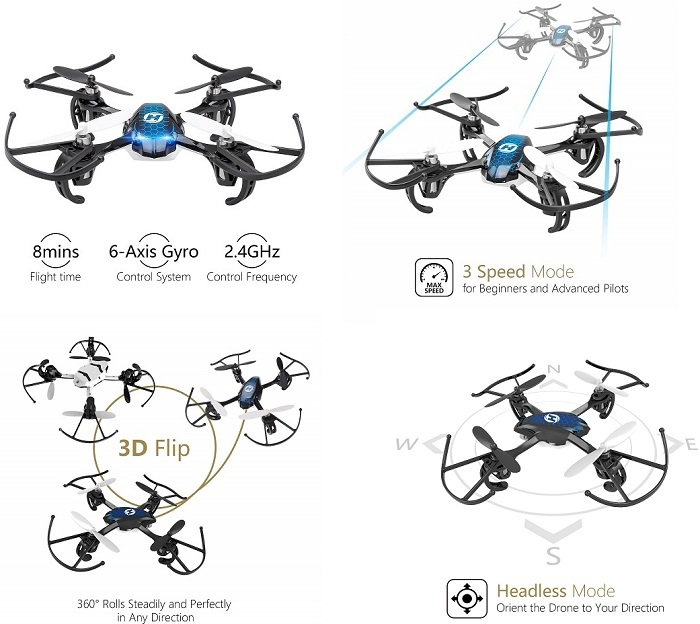 This mini-drone comes with propeller guards and one extra set of blades so you don’t have to worry about crashing. Equipped with four high-powered engines keep Holy Stone HS170 Predator steady in the air thanks to the 6-axis gyro stabilization system and the screw-attached propellers. Furthermore, due to the headless mode technology, this drone will always be oriented in the direction of the controller and not in the direction of the drone’s head. The headless mode option can be activated by pushing and holding the button. There is also a cool trick button which when pressed will cause the drone to do a front or a back flip. During flight, pressing down on the right stick to initiates a full 360-degree flip in any direction. It makes even a beginner feel like a pro. It takes about 30 minutes to charge the battery, and you get about 8 minutes of actual flight time with a flying range of about 100-165 feet. The controller itself is very comfortable to use. • Shock and wind proofed. • Comes with extra propellers. • No FAA registration required. • Excellent controls response time. • The motor assembly can easily break. • No inscriptions on the remote control. • Short flying times (only up to 8 minutes). 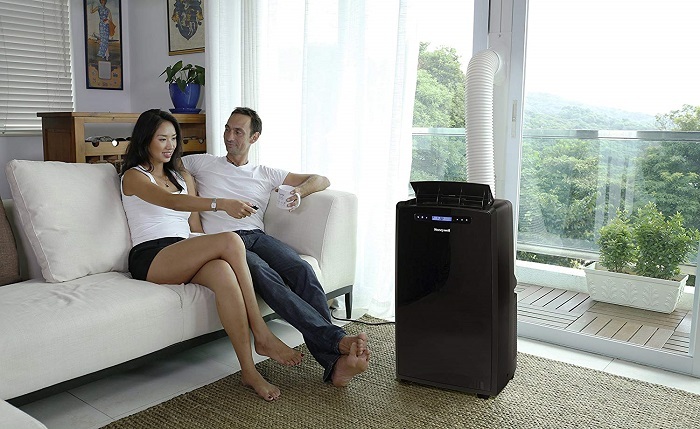 • The motors and circuit board may heat up with use (take a 10-minute cool-down). 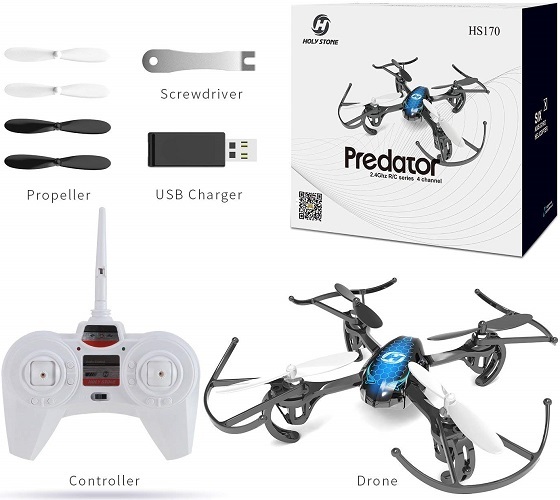 Holy Stone HS170 Predator is one of today's best-selling mini drones you can buy. 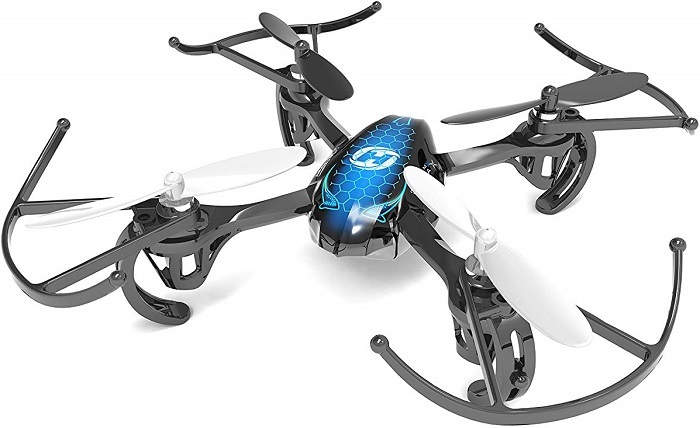 This mini-drone is very easy to control even kids can use it without any problems. It brings responsive performance and can handle bumps, crashes and falls quite well.